Forgive, my Jesus. What am I without You? My God, my God, no light, no guide for me, without a priest to whom I can confide all. O Heaven, O Heaven, O Jesus, O Mother! - You didn’t sin, my daughter, you didn’t sin, trust, you have given me the greatest consolation, you have given me all the reparation you could possibly have given. Look, daughter, your guardian angel, who looks after you, now receives the task of caring for you by changing your position when these battles make it necessary. Be cheerful, I'm with you! I was in the usual position. And after a while, I began to feel that I still had that rich treasure that the devil had made me forget. My soul felt so much joy seeing the wealth that I possessed! And I wished to embrace the rich treasure, I wanted to kiss it. I felt the joy of a mother who, having lost her son, found him again. I cannot tell the joy of my soul. I cannot tell the concern that this gives me, I'm always afraid that someone might rob me. I want to do everything, I want to suffer everything so that there is no danger. Yesterday, without thinking, said something that Jesus seemed to dislike. I was very sad. I humbled myself before the Lord, I was embarrassed. - Forgive, my Jesus. What am I without You? This pain stayed with me the rest of the day and most of the night. At dawn, when doing my preparation for the coming of Jesus, I could not withstand the pain. I cried and cried. What great pain I felt for having hurt the Divine Heart of Jesus. I wanted a priest with holy absolution to cleanse my soul. You Purify me, Jesus, You cleanse me. Oh, the pain I suffer for having seen You hated. I am alone with no comfort from the earth. I do not blame You. Forgive me, forgive me! I accept the pain I suffer for those who displease You, and for all who sin seriously without knowing it. This pain continued throughout the day and I kept careful watch over my heart. I have an intense craving to have whole worlds, thousands of them, crying out: Love, love Jesus! My God, I do not know if I’ll win, I do not know if I can endure so much suffering. I want to see You loved by everyone and not offended. I cannot bear to see You suffer. O sin, sad sin, that so hurts Jesus! O Love, O my love, what kind of caresses have You got in store for me? I wait for them, I see them. I'm afraid. If they hurt me a lot, I love You. The greater the pain, with Thy grace, the greater my love. O Heaven, save me, help me! On this hymn, Father Umberto Pasquale writes that it has “the rhythm of a psalm” and “it is dotted by poetical hastiness and is surpassed by Saint Francis of Assisi’s seraphic fervour”. Father Mariano Pinho refers to it as “the precious praise chant, which reminds us of St. Francis’ Chant to the Sun or the Benedicite”. 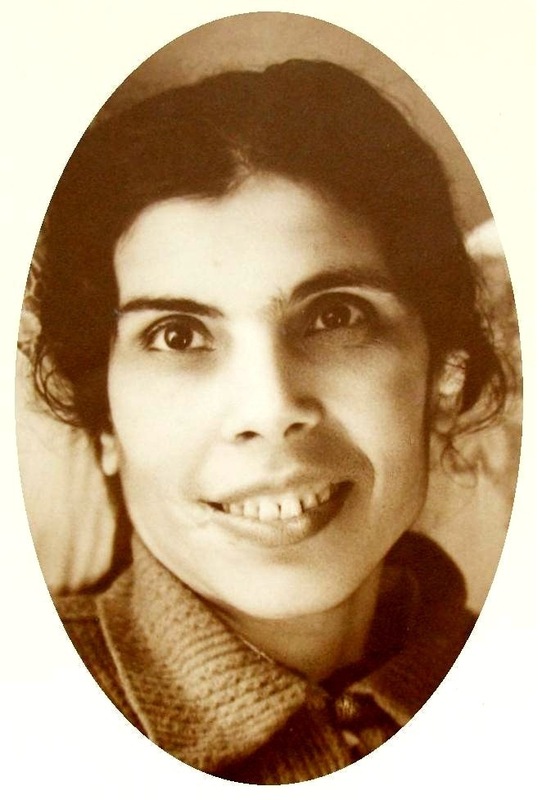 On the other hand, Mr and Mrs. Signorile, call it an amazing offertory chant: “Her (Alexandrina’s) inflamed, unrestrained love, overflowing from her full heart, bursts into an amazing Offertory Chant”. Acts of love for your Tabernacles. - My daughter, unite your pain with mine, knead it into the love of my Divine Heart. I knead mine into yours. Love Me, you are loved by Me, you are safe full of riches, a repository of divine gifts. My daughter, dear angel, your pain went to adorn the mantel and crown your Blessed Mother gave you. What light, what brilliance it was given! It is the pain of glory, it is the pain of salvation. It is the sea of ​​martyrdom, the sea of ​​immolation. My daughter, heavenly garden of divine flowers, sweet meadow that grazes sinners, feed them with grace, purity and love. Keep them, guide them, divine shepherdess, shepherdess chosen by Jesus. Purify them, purify them for Me, guide them, drive them towards to my Divine Heart. My daughter, mistress of the divine sciences, hold what was deposited in your heart by Me and My Blessed Mother eight days ago: it is the world, they are sinners. It is infinite value, it is my divine Blood. They are souls saved by your pain. This desire of wanting to guard, and not knowing how to, is torment that will consume you until your death, it will increase day by day. My daughter, in whom is written all that is divine: in you they will learn to love, in you they will learn to suffer, in you they will learn to know how I communicate with souls. They do not know, they do not study what is written. This negligence of theirs causes so much hurt to my Divine Heart! Have courage! Who suffers with me wins. How many tears of regret they will cry seeing that your name, now so disdained, is with Me and my blessed Mother on earth and will be glorified in heaven! Come, my blessed Mother, come to comfort my, and your daughter, come and cover her with your caresses. - My daughter, queen chosen by Me and my divine Son, you will be in heaven on a throne by my side, and the side, of my Divine Son, as queen. I as Queen of Heaven and you as queen of earth. - My Mother - Jesus said - feed her, give her your life, the life of the soul which she always lived, and the life of the body which she needs. - My daughter, with my Blessed Mother I am giving you that comfort that you should receive from men. When years ago I said I would be your director, I was referring to these times; it was not separate you from your director (Padre Pinho). Yes, I needed him in union with Me to guide you ant take you to the heights that divine my love requires. I already saw the cruelty and persecution of men. Courage! Your name that you feel has been disparaged, soon will be talked of with respect, and praised along with mine. - Thanks for ever, my Jesus. The more things You tell me the more miserable and wretched I feel before You. Gives me comfort to carry the Cross. Amid the darkness, in so much dryness. To love your and my Lord with it! On 9 October 1950, Fr Leopoldino reports the arrival of the sculptor José Ferreira Thedim in Balasar, from S. Mamede do Coronado. At first people might think he would be one of the many pilgrims, who came to visit Alexandrina, or he might have come and gather information for a new image of Our Lady of the Conception whose destiny was the parish church. Read about what the same journalist reported on the Immaculate Conception Day in 1952. 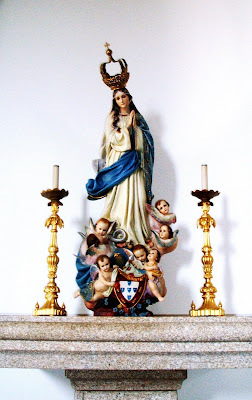 On the Immaculate Conception feast, in which a distinguished prior of the parish of S. Sebastião, Guimarães (the priest José de Jesus Ribeiro), preached, a new statue of Our Lady was blessed , a generous and devoted gift from our emigrants in the State of Rio de Janeiro, Brazil. The image is a lovely masterpiece, both in the art of sculpture and in painting, revealing the author’s skills, which honors his workshop. All the people praise him a lot”. The Mother of God tramples the serpent under foot, as it is usual in such representations, and under her feet there lies a globe. The five shields intend to the fact that Our Lady of Conception is the patron saint of Portugal. José Ferreira Thedim (1892-1971) was born in S. Mamede do Coronado, where he developed his art. His father was a sculptor as well his siblings. The statues by Thedim excelled exuberance: he was the only one shaping, designing and making all this by himself. There was a special environment in the workshop: a silence that resembled a church. In 1917 he was asked to carve the image of Our Lady of Fatima. Thedim was then introduced to Sister Lucia to collect data for his work, but he also gathered ideas from a Spanish book. His work finished, with one meter and three centimeters from the pedestal to the skull, the image was sent to Fatima and blessed by the local priest in May 13, 1920 and placed in the Chapel of the Apparitions in June 13. From then on Thedim’s work got known internationally, to such an extent that in 1931 he was awarded the title of Knight Commander by Pope Pius XI. In 1947, the sculptor created the image of the Pilgrim Virgin, having met Sister Lucia once again. His work is spread all over galleries, churches, monasteries and convents around the world. His first images were made of cedar wood from Brazil, S. Paulo, Parana and Santa Catarina States; it was a woody and colored material, with a distinctive smell and good for carving.